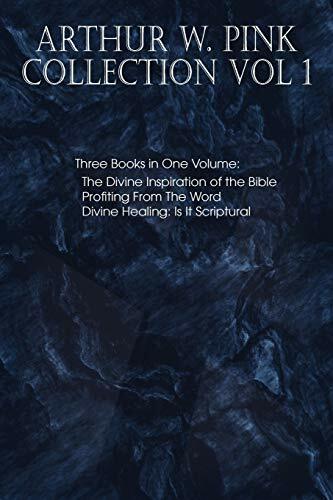 Arthur W. Pink Collection Vol 1 includes three Arthur Pink classics; The Divine Inspiration of the Bible, Profiting From The Word, and Divine Healing: Is It Scriptural. "Christianity is the religion of a Book. Christianity is based upon the impregnable rock of Holy Scripture. The starting point of all doctrinal discussion must be the Bible. Upon the foundation of the Divine inspiration of the Bible stands or falls the entire edifice of Christian truth.-"If the foundations be destroyed, what can the righteous do?" (Ps. 11:3). Surrender the dogma of verbal inspiration and you are left like a rudderless ship on a stormy sea-at the mercy of every wind that blows. Deny that the Bible is, without any qualifications, the very Word of God, and you are left without any ultimate standard of measurement and without any supreme authority. It is useless to discuss any doctrine taught by the Bible until you are prepared to acknowledge, unreservedly, that the Bible is the final court of appeal. Grant that the Bible is a Divine revelation and communication of God's own mind and will to men, and you have a fixed starting point from which advance can be made into the domain of truth. Grant that the Bible is (in its original manuscripts) inerrant and infallible and you reach the place where study of its contents is both practicable and profitable." "There is grave reason to believe that much Bible reading and Bible study has been of no spiritual profit to those who engaged in it. We greatly fear that in many instances it has proved a curse rather than a blessing. This is strong language, we are well aware, yet no stronger than the case calls for. Divine gifts may be misused, and Divine mercies abused. That this has been so in the present instance is evident by the fruits produced. Even the natural man may take up the study of the Scriptures with the same enthusiasm and pleasure as he might of the sciences. Where this is the case, his store of knowledge is increased, and so also is his pride. Like a chemist engaged in making interesting experiments, the intellectual searcher of the Word is quite elated when he makes some discovery in it; but the joy of the latter is no more spiritual than would be that of the former. Again, just as the successes of the chemist generally increase his sense of self-importance and cause him to look with disdain upon others more ignorant than himself, so alas, is it often the case with those who have investigated Bible numerics, typology, prophecy and other such subjects." "Divine healing?" Is it scriptural or unscriptural? This is a question which it is not easy to answer in a single sentence. Many passages on healing may be cited from God's Word, but that raises the question of their interpretation-in accord with the context and also in harmony with the general Analogy of Faith: as it also calls for a careful examination of all inferences drawn from and conclusions based upon those passages." Arthur Walkington Pink was an English Christian evangelist and Biblical scholar known for his staunchly Calvinist and Puritan-like teachings. Though born to Christian parents, prior to conversion he migrated into a Theosophical society (an occult gnostic group popular in England during that time), and quickly rose in prominence within their ranks. His conversion came from his father's patient admonitions from Scripture. It was the verse, Proverbs 14:12, 'there is a way which seemeth right unto a man, but the end thereof are the ways of death,' which particularly struck his heart and compelled him to renounce Theosophy and follow Jesus. Arthur W. Pink has held various pastorates in the United States. He has been engaged in Bible conference work in the United States, Australia, and other countries and resided in Scotland up until the time of his death, July 15, 1952. Pink was the author of various books and booklets on Bible exposition, as well as the editor and publisher of a Bible study magazine, Studies in the Scriptures.